The extensive selection of nylon Hunter is made of high quality polyamide webbing. This extremely durable, tear-resistant and durable strap is offered, such as in a car safety harness and of course in different collar variations and line lengths in different models. With this Hunter Collar Vario Basic nylon with aluminum buckle, you have a perfect complement to your necklace range. By using the practical slide this Collar is infinitely adjustable. 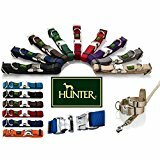 Hunter Dog Collars, Leads and Training Leads Our top selling Hunter range is manufactured in Germany using soft polyamide nylon and fitted with a high-quality strong aluminum clasp that is particularly resilient. The low weight of the ALU-STRONG clip guarantees special wearing comfort. It is also easy to open and close. The collars are also fitted with a metal slide so the size can be individually adjustable. These collars can not be worn in sea as salt can corrode the metal clasp. This entry was posted in Dogs and tagged ALUStrong, Black, Collar, colours, Hunter, Sizes, Small, VarioBasic by One Boutique. Bookmark the permalink.